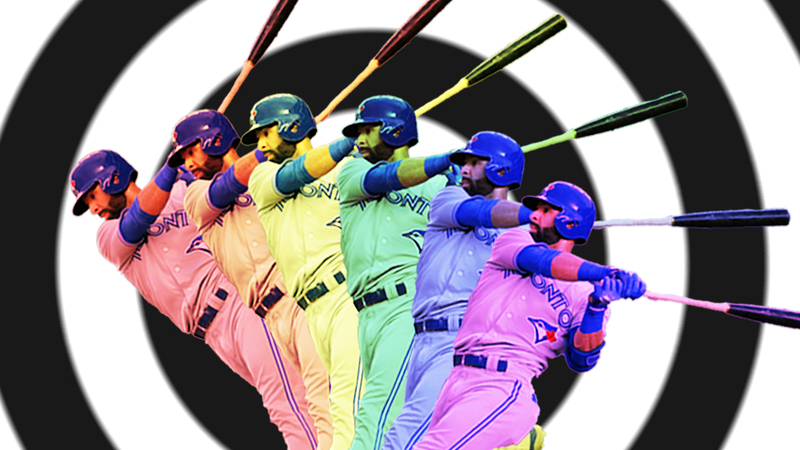 The postseason is upon us, and we can count on clutch hits, critical walks, epic homers, and – of course – the associated theatre of championship bat flips. One of the most famous postseason bat flips belongs to Jose Bautista of the Toronto Blue Jays after his three-run seventh inning blast in Game 5 of the 2015 American League Division Series against the Texas Rangers (Tom Lawless certainly has a case though). Here we’ll take a look at this Hanley Ramirez classic stick twirl. I chose it because the camera caught all of it, the camera was not zooming in or out, and the bat was mostly moving in a plane perpendicular to the camera direction. Below is a sketch that is based upon the position of the bat in each frame of the video. The images are numbered in time sequence. You see the motion appears to be wildly complex with little discernible pattern. I have taken some liberties in this sketch because the exact position of the bat was often difficult to discern in a few of the video frames. Yet, despite this underlying simplicity, the game unfolds into a myriad of complex, dramatic, and beautiful scenarios. Physics works the same way. The underlying ideas are simple, but they explain everything that is explainable about the known universe. 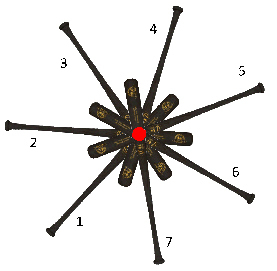 The key underlying idea to explain the complex motion of the bat flip is called the “center-of-mass” or CM. There is of course a detailed mathematical description of the CM, but let’s be more practical. The way to find the CM of a baseball bat is to balance it on one finger as shown below. The red spot in the dead center of the bat directly above your finger is the CM. You might note the CM is on the barrel side of the bat because the barrel contains so much more of the bat’s mass than the handle. 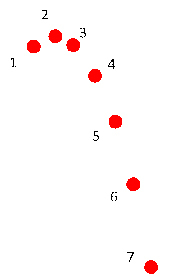 Below is the same collection of images of the motion of the bat except the CM has been marked in each image. Now, let me remove the images of the entire bat leaving just the location of the CM. You’ll see that the motion of the CM of the bat is exactly the same as the motion of a ball thrown with the same initial speed and direction of the CM of the bat. 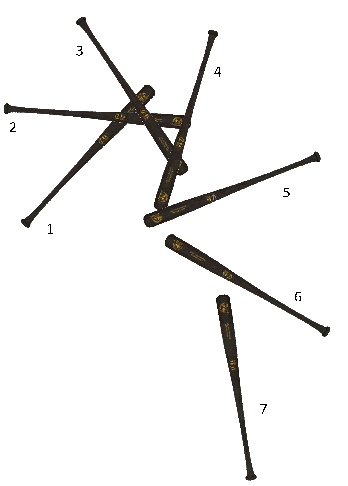 That’s a pretty amazing simplification of the intricate motion of the bat, but it ignores the rotation of the bat. Focusing just on this rotation, I’ll take the images of the bat, but I’ll align the CM’s from each image. The result is shown below. The bat rotates like clockwork about its CM! So, the complex and stirring motion of the bat during a bat flip can be explained by looking at the overall motion of the center-of-mass which is the same as the motion of a baseball with the same initial speed and direction combined with the steady rotation of the bat about its center-of-mass. So, love the bat flip or despise it, perhaps we can all agree that the motion of the bat is beautifully complex and, at the same time, delightfully simple. David Kagan is a physics professor at CSU Chico, and the self-proclaimed "Einstein of the National Pastime." Visit his website, Major League Physics, and follow him on Twitter @DrBaseballPhD. Great stuff, Dave. Superb graphics. Perhaps someone smart could take my batcast articles and improve my hack-math? No need for an apology at all. My silly article wouldn’t have helped you or inspired you in the least – I am just hoping for more physics on bat flips. Those graphics are a thing of beauty! Bob Gibson’s First Law: For every bat-flip, there is an equal and opposite cap-spin. Probably top 10 article on Fangraphs and certainly in the running for best ever for Hardball times. 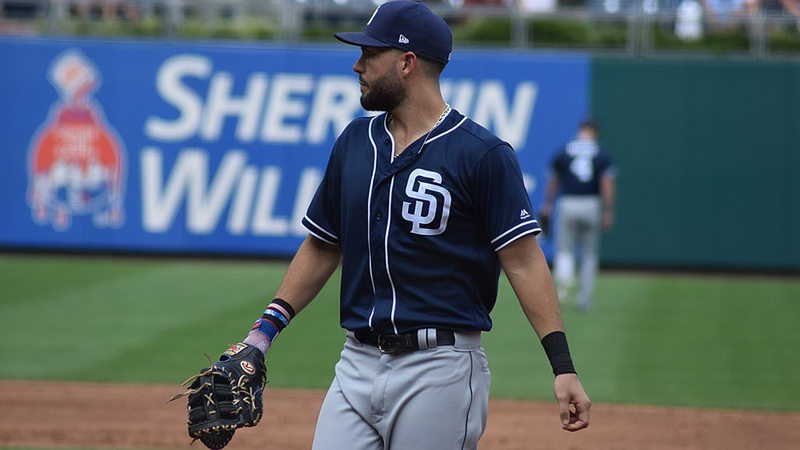 Never before has an article taken such an in depth look at one of the more important aspects of baseball. No more can the psychological warfare that is bat flipping ne ignored. As that Hanley bat flip shows everything that is truly great about baseball. It was so outrageous, Salvador Perez couldn’t even stay mad at him. Nice example of center of mass, I hope it shows up in some school science classes. If you ever get to go into the Vomit Comet and spin a bat around its center of mass, please post video. Each year I send a few “Physics of Baseball” articles to the AP-Physics teacher who works the chains with me in the fall at HS Football games…this one is going to him today!